Hope everyone has had a great Labor Day weekend! I haven't posted in a week because life got in the way, but I'm back with a new recipe that I tried a few days ago. I had some really huge, beautiful red bell peppers, so I decided I wanted to make dip. I love the red pepper dip made with sour cream and cream cheese, but I wanted to find a healthier dip this time. I remembered seeing a different recipe at Smitten Kitchen awhile back. I was intrigued, as it is made with white cannelini beans and jarred roasted peppers. I had some peppers to use, so I roasted them under the broiler. I wasn't sure if I was going to like it at first, but after it's refrigerated and the flavors develop, this white bean roasted pepper dip is really delicious! Very different, but so tasty with pita chips or good crackers. I had to take pictures quick before my husband devoured it! My kids were not as enthusiastic about it and said it was just ok. Can't win them all! To roast the peppers: Cut peppers in half; remove membranes and seeds. Line a baking sheet with foil. Lay pepper halves on pan and flatten with you hand. I have an electric oven, so I put them under the broiler with the oven door ajar and roasted the peppers until black. Remove from oven and place peppers in a bowl and cover immediately with plastic wrap. As the peppers cool, they will sweat and you can easily peel off the skin, when ready. Coarsely chop peppers. In a blender add the drained beans, chopped red peppers, garlic, lemon juice and goat cheese. Blend well. Pour into a container and refrigerate a few hours so the flavors will marry. This dip is not as thick as one made with cream cheese, but it is very tasty. I hope you enjoy it! I love a good dip! This sounds wonderful. 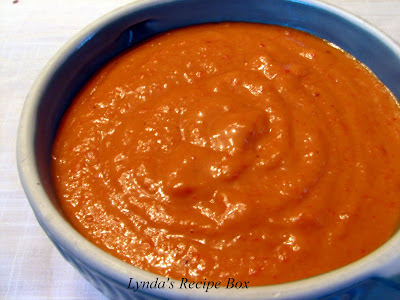 Sounds like a great flavor combination with roasted red pepper and white beans, delicious dip! What gorgeous color. Where are my pita chips when I need them? That looks so vibrant and delish! I am loving this dip - what grand ingredients. And how pretty. 'tis the season to roast peppers! What a perfect recipe. You're absolutely right. You can't win them all, but I think this looks great! what a fabulous dip! I've made a dip like this before, and it was truly hard to stop eating! Looks velvety smooth and full of flavor. Love the red color! I think roasted red peppers is an acquired flavor, but one that I would enjoy for sure. This sounds like a delicious dip, and it just so happens that I have several red peppers in the garden that are in search of a recipe. Thanks, Lynda.